Hotel katerina Designed and constructed in the Cycladic Style, at Agios prokopios beach in naxos, with all conforts, in a picturesgue tranquil ambience.Swimming pool with Jacuzzi installation preferred fo a real vacations. Only few steps from the best beach of the island, in the mild and conforting air of the sorrounding Fields, among flowers and trees. 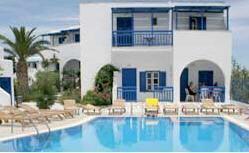 Bar, Garden, Non-smoking Rooms, Rooms/Facilities for Disabled, Free Parking, Breakfast Buffet.